Simple (dump it and forget about it) slow cooker pulled pork sandwiches with a delicious sweet honey chipotle sauce and an easy coleslaw. When I was little, purple cabbage terrified me. My mom used to buy the big bags of chopped iceberg lettuce that have the shredded carrots and pieces of purple cabbage in it. I’d never actually tried purple cabbage by itself and when I did eat it from the salad mix, it was DRENCHED in ranch and swallowed as quickly as possible. Followed by a large glass of water I’m sure. I’m not totally certain why it scared me, but I’m pretty sure I was just copying my older brother who didn’t like it at the time either. One time my older brother snuck his cabbage on my plate and I just could not eat his along with mine. I ended up tattling and his punishment was to eat not only his purple cabbage that was on my plate, but mine too. I was elated. Clearly so much so that I still remember that dinner from probably 15+ years ago. ? Fast forward to today and I am obsessed with all things purple cabbage. And I suppose to make up on missed time enjoying this vegetable, it ends up in our dinners + salads all.the.time. It also has earned a place in my favorite ever coleslaw and trust me, it makes for the absolute best coleslaw ever. As much as I want to tell you this awesome coleslaw is the star of this sandwich show, it is not. This pork is the absolute best pork I’ve ever had. It’s hands down the husband’s favorite meal that I make and we have it at least once a month in our home. I’ve made this and tweaked the sauce so many times over the past couple of years that I believe it’s absolutely perfect and ready to share. The sauce is a honey chipotle BBQ sauce, but don’t be scared away from the chipotle. It is so easy to adjust to your desired heat preference. The sauce can either be pretty hot (yesssssss!) or completely mild with barely a kick at all. If you want a hotter sauce, you will use an actual chipotle pepper. Not so hot? Just use a tiny bit of the sauce surrounding the chipotle peppers. Always start with very little and increase after taste testing the sauce. I would avoid omitting the chipotle peppers (or sauce) at all because it does give it a signature smokey depth of flavor, but you can if absolutely needed. Note that if you do make this sauce in advance (and place it in the fridge), it does get hotter and hotter the longer it sits. I love making the sauce in the morning along with throwing the pork in the crockpot because come dinner time there is literally no prep and both the pork and the sauce have become ULTRA flavorful. ?? 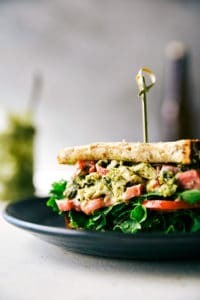 Make sure to SAVE THIS RECIPE to your Sandwich Pinterest boards! Place the pork on top. In a small bowl, whisk together the brown sugar, chili powder, minced garlic, 1 tablespoon of seasoned salt, and ground cumin. Rub into the pork. Pour the chicken broth over the pork. Cook for 6-8 hours on high or 9-11 hours on low. Once the meat is completely cooked through, drain the liquid and discard (or eat) the onions. Using two forks shred the pork. In a blender combine the ketchup, brown sugar, honey, apple cider vinegar, Worcestershire sauce, minced garlic, 1/4 teaspoon salt and a pinch of pepper. Pour the sauce over the pork and mix until combined. Top a bun with a generous amount of the dressed pulled pork. Prepare the coleslaw according to directions (click the link) and add the red cabbage. Top sandwich with prepared coleslaw and enjoy! 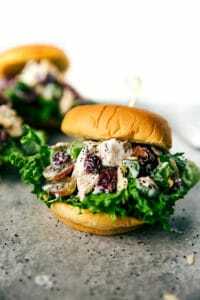 Skinny Chicken salad sandwiches (no mayo)! Previous Post: « Greek Yogurt Scones — Two Flavors! i didn’t make the coleslaw, but the pulled pork is delicious. The bbq sauce has the perfect amount of sweetness and slight kick from the chipotle. I’m sure i’ll be making this again…and sharing it! I’m so thrilled that you enjoyed the pork and the sauce! 🙂 Thanks so much for the comment Lisa! When do you add the honey bbq sauce to the pork? After the pork has been cooked 🙂 Under the “Sauce” Instructions it’s number 4. Hope that helps! Does this freeze well after being in the crockpot? I’m sorry Whitney, I’ve never tried freezing this particular dish so I have no idea how it does after being frozen. Wish I could be of more help! Not seeing the coleslaw link, nothing highlighted to click on ??? Sounds delish. I think if I were to make a big batch of this I would buy some pork shoulder and cut it into 2″ pieces, then brown it on the grill first. I love to brown the meat first as it adds an extra layer of flavor. I also like a dash of molasses in the cooking sauce! Thanks for the awesome recipe. I was a little worried, as the sauce was so sweet, but it all worked together wonderfully! I wanted to let you know that you forgot to add the season salt to the rub ingredients list. You have it in the written instructions – but not in the listed ingredients – so I almost missed it! Can you make the barbecue sauce a few day’s ahead of time? What cooking time would you suggest for a larger roast (7-9lbs)?